When it comes to taking the prize at wine competitions, Magnavino Cellars is having a vintage year. The Oxnard, California winery recently won the Platinum Best of Class Medal for its 2010 Petite Sirah at the renowned San Francisco Chronicle Wine Competition. OXNARD, CA (February 2014) – What does a prestigious winery do when it knows it has created some of the smoothest, most unique, artisanal and hand-crafted varietals in its history? Enter them in wine competitions, naturally. That’s exactly what Magnavino Cellars did recently and now the winery, headquartered in Oxnard, California, has a host of new medals to add to its growing collection. The winery’s 2010 Petite Sirah, in all of its inky elegance, won the Platinum Best of Class Medal in the 2014 San Francisco Chronicle Wine Competition. Also winning a gold medal at the competition, held in January, was the 2010 Cabernet Sauvignon. Magnavino wines also won six silver medals and five bronze medals. To date, the winery has won 46 medals in prestigious North American competitions. The Petite Sirah is crafted using 100% Petite Sirah grapes harvested from the Lodi region of California’s central coast. Because of the area’s terroir, with hot days and cool nights, the grapes are able to mature to near perfection. They are hand-harvested and crushed, then allowed to ferment for approximately seven days before being pressed and barreled in a mix of French and American oak. Bottling takes place in mid-August, and the public is invited to watch. 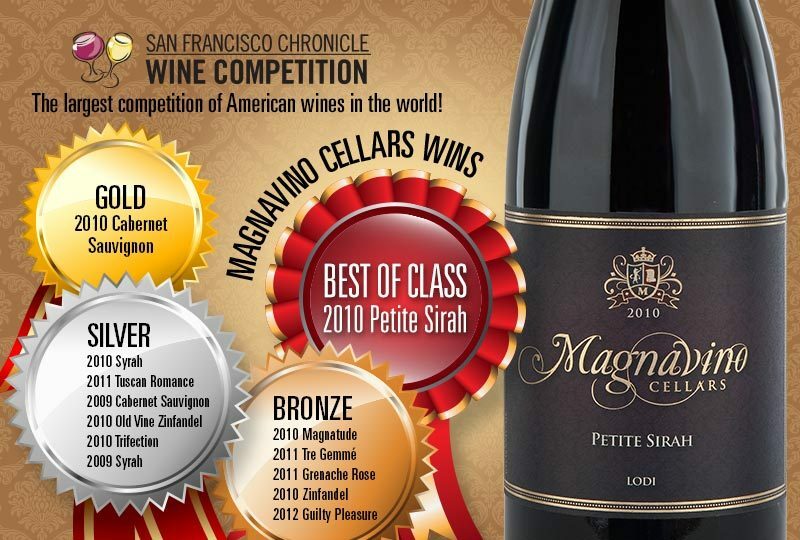 The 2010 Petite Sirah was also awarded the Gold Medal at the 2013 San Francisco International Wine Competition. At the LA International Wine Competition a 92-point rating was bestowed on the 2010 Syrah, one of the winery’s most popular wines. Magnavino Cellars was also a recent participant in the Ventura County Wine Trail Local Food & Wine Challenge where it served Tuscan Romance, and took first place, with its partner Café Zack. Magnavino Cellars currently bottles 17 wines: Beautiful (a white blend), Butterfly Chardonnay, Pinot Gris; Grenache Rosé; and Cabernet Sauvignon, Grenache, Merlot, Old Vine Zinfandel, Petite Sirah, Sangiovese, Syrah, and Zinfandel. Red blends include Magnatude, Tre Gemmé, Trifection, and Tuscan Romance. There is also a dessert wine with the appropriate name of Guilty Pleasures. The winery, located at 961 North Rice Avenue in Oxnard, has a wine club. Its Tuscan-inspired tasting room is open Saturday and Sunday from 11 am to 6 pm. Magnavino Cellars began making wine in 2008. Winemaker Robert Wagner is involved in every aspect of the winery, from sourcing grapes, to shepherding each varietal through crushing, fermenting, pressing, aging and bottling. Each element helps determine a big, bold, beautiful, hand-crafted wine. The winery uses only the most modern winemaking technology, including stainless steel tanks and American and French oak barrels. Can I drink red wine with everything? What is bouquet and can I pick it? Enter email address to recieve information featuring local events, savings and more!